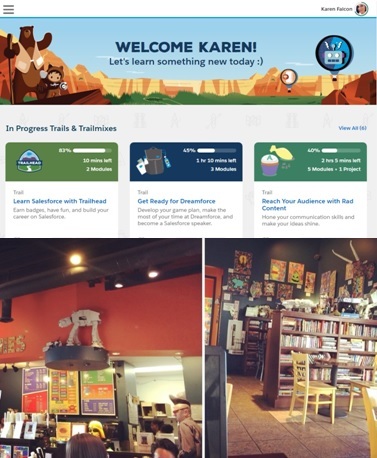 I am having a really great time diving right into Trailhead by Salesforce. I am still driving taxi in Las Vegas and a while back, one of my passengers told me about these online, free courses. I had heard of Salesforce over the years, but never took the time to learn how much they have evolved as a company and a force for good. I finally took a chance, just the other day, to check it out on my cell phone, not knowing huch much I'd really be able to get accomplished on my phone, but to my surprise, I have blazed through many modules, 11 badges, 2 trails and climbed the ranks to the next level beyond the 3,000 point mark to Explorer; all in just a couple days, so far, with only my iphone 5s. My taxi work day is over and I am at this cool coffee shop, Grouchy John's, on the way home and am about to tackle my first hands-on projects with Trailhead. For these next challenges, I took a dose of reality and figured it would have to be done on the larger screen. I honestly didn't even look at any of the hands-on projects via my phone, just the relatively simple modules of general education of Salesforce, Trailhead, writing, presentation, equality, diversity and so on. While on my laptop here at the coffee shop, taking advantage of their wifi, I couldn't resist perusing a few old, familiar bookmarks clinging to my browser. I noticed I hadn't posted on my blog since November of 2017. It is both interesting to me that it has been about six months since I shut off my wifi at home, just to spare myself another bill and a bit of a glim reality at the same time, realizing how much time has gone by while I have been busy struggling to make ends meet driving taxi here in Las Vegas as a living. Why didn't I dive into Trailhead sooner, months ago, when that passenger gently nudged me to start the next adventure of my life? But there is no point in dwelling on the past. I am here now. I am enjoying Trailhead. I know it is both an industry game changer and a life changer for me, not just monetarily, but I am going to be meeting some pretty interesting and incredible people along this journey. This blog post is enough of a little time waster for now. I am anxious to get back to my studies.